This evening will launch the world championship of chess between two veterans, India’s Viswanathan Anand (defending World Champion) and Israel’s Boris Gelfand (Challenger). The first game of the anticipated match begins May 11th and will be held in Moscow’s Tretyakov Gallery. The prize fund for the match is 2.55 million dollars, 60% of which will go to the winner and 40% to the loser. Many see this as being the last stand of the 40ish generation before the likes of Magnus Carlsen (Norway), Levon Aronian (Armenia), Sergey Karjakin (Russia), Hikaru Nakamura (USA) and Fabiano Caruana (Italy) take over. In the era when many sportsman are performing at high levels past their prime, chess is the latest example. Anand is a heavy favorite to defend his title and some polls have as high as 85%. While the odds are firmly against Gelfand, most would agree that he is a tough fighter and will certainly produce some interesting ideas. Gelfand will indeed put up a good fight, but in the end, he must fall. Darius, I will have to politely challenge you on the part of your statement that says Gelfand must fall part. Let’s not forget that he earned that spot to challenge Anand. To underestimate him, is tantamount to saying that the status quo cannot be changed. I am putting 100% effort to eventually see my son break the stigma of who can be world champion and hopefully I will see it before I expire. So when I hear comments like the underdog must fall, I get annoyed and would love to hear the reason behind such remark. I am a lover of clean debates, so please feel free to make the second move. Gelfand is prepared for this, but it will be interesting to see how he handles this match over the long haul. Of course, he also has the support of Russia. There will be many subplots with each team having to adjust to changes. Anand’s team has quite a bit of experience in this, but it will be a better match that Anand-Topalov. They just announced their seconds at a press conference. Gelfand: GMs Alexander Huzman (Israel), Maxim Rodshtein (Israel) and Pavel Eljanov (UKR). To Anand’s credit, his story is exactly what you have mentioned… changing the perception of who can win the championship. His tenure has been good for chess thus far and most notably, peaceful. I’m sure there are a lot of players (like Josh), players in India, Asia and all developing countries who are inspired by his story. I believe Josh would love Anand’s games if he studied them closely. Gelfand’s games are also rich and he is an expert on the Sicilian Najdorf. In the first game of this championship bout, Anand eschewed 1.e4 and played 1.d4. Gelfand pulled the first surprise with a Grunfeld, an opening that may have been the result of home preparation. Fortunately Anand had looked at it and quickly played a counter surprise in 8.Bb5+ Nc6 9.d5!? This sent Gelfand into a long think, but he found his way through a maze of variations. Daaim, all of a sudden he is interested in studying everything. If I am wrong, so be it. But I think he has what it takes to be a world-class player. I’ve always known that he was a quiet genius who doesn’t want people to know about his abilities. Like a typical whiz kid he has a hard time expressing his talent to others because the he doesn’t understand it himself. Remember, not until now, he never really had a coach who was smart enough to realize that this kid is a genius. His current coach is the first to notice that and I love him. Studying endings would help him tremendously. Game two in the World Championship match between Viswanathan Anand and Boris Gelfand saw another draw as many commentators asserted that this was the “feeling out” process. GM Nigel Short even opined that there should be longer matches to allow for adjustments by each of the camps. While today’s game was only one move longer than yesterday’s 24-mover, the battle of wits is on. Thanks for your comment Guy. I am by no means underestimating Gelfand. For him to have gotten here just shows what a talent he is. It’s just that I have always liked Anand. He is very consistent and humble, avoids conflict and unnecessary cheap chess politics. That’s the type of personal character that appeals to me. It reminds me of the way I like Nadal in tennis and want him to obliterate whatever oposition in his way. Mr Mukonde, I am pleased about your well thought out reply. In hindsight, you have made it very clear that when you said “ Gelfand must fall” it was just an expression, and nothing more. There is a thin line between when you’re for someone and not against the other, but making that point in ink can be tricky. I thank you for the explanation. Gelfand is tough fighter but Anand is more creative.Gelfand is aggressive but Anand is cautious.The chess world champion should have qualities that transcends boundaries of time.He has to be special.This is the reason why there are only 15 real world champions in the span of 126 years.That is the reason why likes of Bronstein,Polugaevsky,Paul Keres,Korchnoi could never became world champions.This extra something will pave the way for Anand’s victory. Anand is a good champion, but this will be a fight. The good thing about Anand as a champion is he does not get involved in controversies that dogged our chess world for more than 40 years. He broke the cycle. No European or American world champion would have agreed to holding the championship in the challenger’s home country (Anand-Topalov). He simply wanted to play chess. He should be commended for that alone. I also believe Anand is a good role model not only for Indians, but for people in the developing world (i.e., Asia, Africa, Caribbean, Latin America) and “minorities” in the developed world. It is very good that chess now has universal appeal and in coming years China and India will be major forces. It is unclear what the chess world would be like with Gelfand as the champion. How much will chess be advanced in his reign? It’s hard to say. He is not the combative type, but would chess resort to the same old political embitterment of the past? Interesting questions. Let’s look forward to some fighting chess! After weathering the storm of Boris Gelfand’s assault, World Champion Viswanathan Anand was pressing for the win with his extra pawn. Unfortunately, the champion was bitten by the time pressure bug and he missed his opportunity. During writing the report for the U.S. Championships, I decided to check the Anand-Gelfand match and discovered they had already drawn. The game lasted 1h40m. 6 draws? not looking good for the popularity of the game. Sorry. I’ll catch up with the reports. I’m traveling, but not much to report here anyway. I hope this decisive 7th game injects some pace into the competition. You got your wish… Anand equalizes! After eight games, the match is tied at 4-4, contrary to some predictions that gelfand would defeated easily. I like it this way since many will have to reassess their predictions. Yes… although today was disaster for Gelfand with a 17-move loss. Not much in today’s game, but there was an interesting pawn sacrifice after 14…O-O 15. Nxd5 Bxd5 16. Bxd5 Nxd5 17. Rxd5. White immediately gave the pawn back after 17…Rac8 giving black adequate compensation. 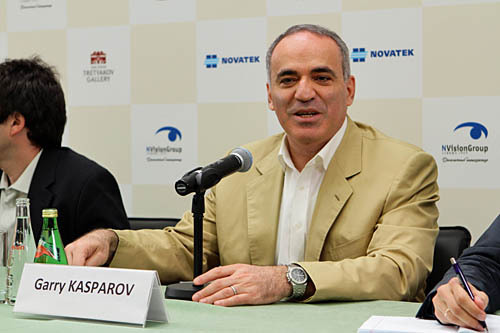 Former World Champion, Garry Kasparov gave comments on the match. With six draws in a row, we are now pass the “feeling out” phase and now the fireworks should begin… and it did. Boris Gelfand got on the scoreboard for his first win in a classical game against Viswanathan Anand since 1993… that is 19 years. Gelfand faced a Semi-Slav and develop a very nice and fluid position. Wow. Six straight draws and now the second decisive game. With Boris Gelfand winning game seven, many felt he would play solidly and merely try to hold with black. 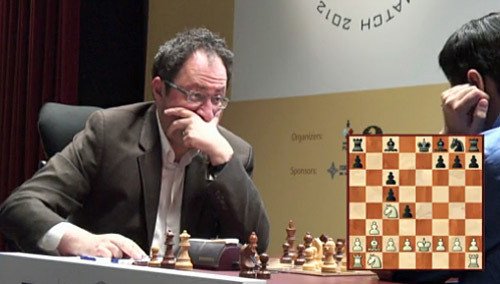 Instead Gelfand went into a wild tactical line and made a huge oversight. Let’s recap. Game already drawn in a Sicilian Rossolimo (22 moves). Are we being set up for rapid tiebreaks?? Boris Gelfand steals a glance. 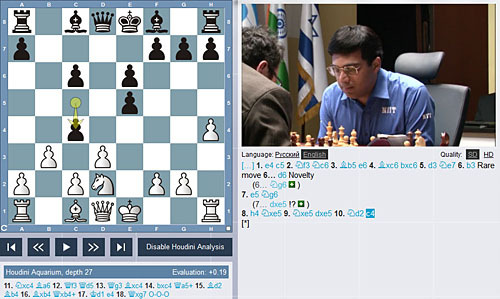 Photos from screenshot at http://moscow2012.fide.com. Anand went back to 1.e4 and after 1…c5 2.Nf3 Nc6, he played the Rossolimo with 3.Bb5. This move is one of the most popular anti-Sicilian lines and carries a bit of positional venom if one does not take it seriously. Gelfand brought an idea with him to the board after 3…e6 4.Bxc6 (much more committal than 4.0-0) bxc6 5.b3 e5!? I saw quite a nickname for GM Boris Gelfand on another site: “Gandalf”. If he wins this championship against the great “Vishy”, his nickname will certainly fit! I wouldn’t go that far. He is a great player with a venerable career, but not so sure this would be earth-shattering news. If Gelfand does win, not sure how much chess will increase it’s profile. Actually Anand has not been marketed very well either. He is huge in India, but FIDE has not increased the profile of chess in his reign. 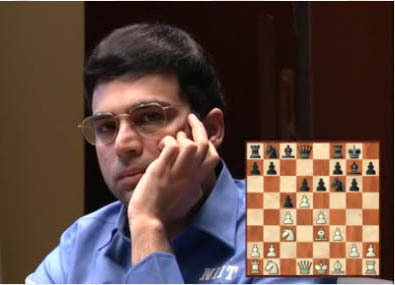 Viswanathan Anand held with a new move in the Nimzo-Indian and put pressure on Boris Gelfand to find precise moves. Gelfand used 35 minutes after 8…Bd7 but waded through the complications and the game was drawn in 24 moves. Anand prepared a novelty, but got nothing. Former World Champion Vladimir Kramnik speaking here with GMs Maxim Dlugy and Etienne Bacrot. He was very critical at the draw offer by Anand. Photo by Alexey Yushenkov. The angst was high amongst the fans, commentators and journalists alike and the Anand-Gelfand match ended in another short draw. The defending champion actually offered a draw a pawn up with an imbalanced position, not testing the challenger. Have elite players become too trusting in the technique of their peers? Perhaps. The match is still tied at 6-6, so a playoff match will ensue on Wednesday, May 30th at 4:00am New York, 12:00pm Moscow. 3.7.1.a If the scores are level after the regular twelve (12) games, after a new drawing of colors, four (4) tie-break games shall be played. The games shall be played using the electronic clock starting with 25 minutes for each player with an increment of 10 seconds after each move. 3.7.2 If the scores are level after the games in Article 3.7.1a, then, after a new drawing of colors, a match of 2 games shall be played with a time control of 5 minutes plus 3 seconds increment after each move. In case of a level score, another 2-game match will be played to determine a winner. If still there is no winner after 5 such matches (total 10 games), one sudden-death game will be played as described below in Article 3.7.3. 3.7.3 If the score is still level after five matches as described in Article 3.7.2, the players shall play a one sudden death game. The player who wins the drawing of lots may choose the color. The player with the white pieces shall receive 5 minutes, the player with the black pieces shall receive 4 minutes whereupon, after the 60th move, both players shall receive an increment of 3 seconds from move 61. In case of a draw the player with the black pieces is declared the winner. Viswanathan Anand retains his World Championship! 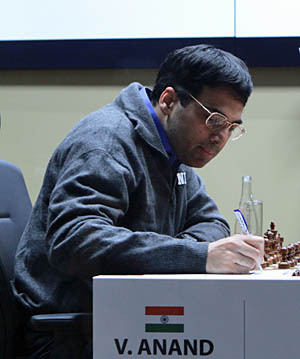 Viswanathan Anand has defeated Boris Gelfand to successfully defend his crown. Anand has certainly etched a place in chess history by defending his world title for the 3rd time since unification. He has held additional titles in both knockout and tournament formats. .